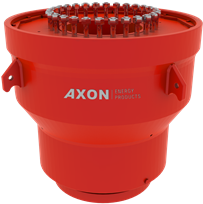 The AXON Type 55 Annular Blowout Preventers are available in two sizes: 29 ½' or 21 ¼'. Four main components comprise the Type 55 BOPs: body, piston, head and packing element. All are designed and manufactured to allow ease of maintenance and ultimate reliability.